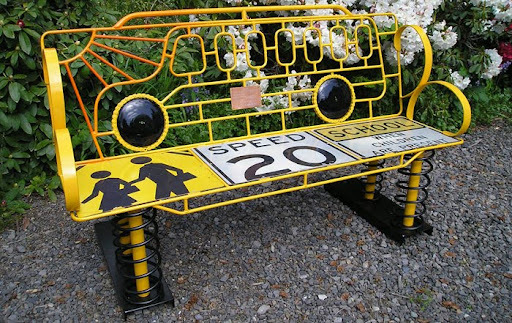 It's not quite back to school time, but these inspiring benches by artist David Feldt certainly educate in the art of recycling. Feldt makes each bench from junk for elementary schools to teach and engage children in the study of assemblage art via reuse. In creating the "To Make You Smile" benches, students are asked to "look at pictures of junk, and create drawings of a bench. Inspired by these drawings, an artist is commissioned to create a bench for permanent display at the school." For links to curriculum for instructors and students, to learn how to implement this green art undertaking at your school, click here.